Electric infrared radiant with shortwaves. Equipped with a safety cord. Interchangeable one-piece reflector body. “SUPERMIRROR” aluminium reflector with a very high reflecting power. Halogen IR lamp custom-built with a shortwave, Teflon cable, and silicone glass fibre – reinforced body. Optimised symmetrical distribution. Made of metal coated with scratchproof epoxy powder. 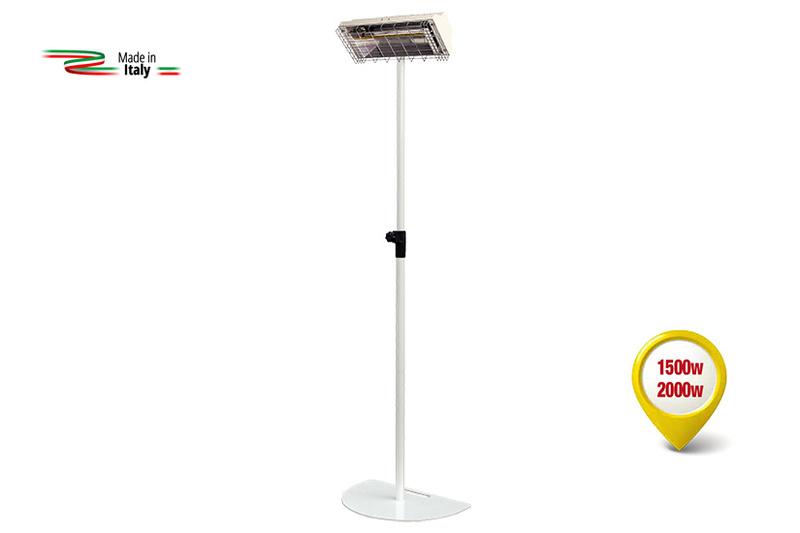 Height varies up to 300 cm Heavy base with a useful handle for the transport. Fully equipped with electric cord, lenght 3 m and Schuko plug. For churches, gyms, industrial premises, machine shops, workshops, tensile structures, sports Palaces, recreational spaces, passageways for railway stations, shopping centers, airports, indoor playgrounds, coffee shops, restaurants, dehors.